Happy New Year from Kate and I! Over the last month, Kate and I have been trying not to let ourselves get too distracted by all the food and festivities that come with Christmas. Instead, we’ve been working away at all our planning and preparation, slowly making our way through the ever-growing “To-Do” list (aided of course by the not-so-occasional mince pie). The week before Christmas we popped in to say hello to Wim and the fab team at FreshWater Watch. 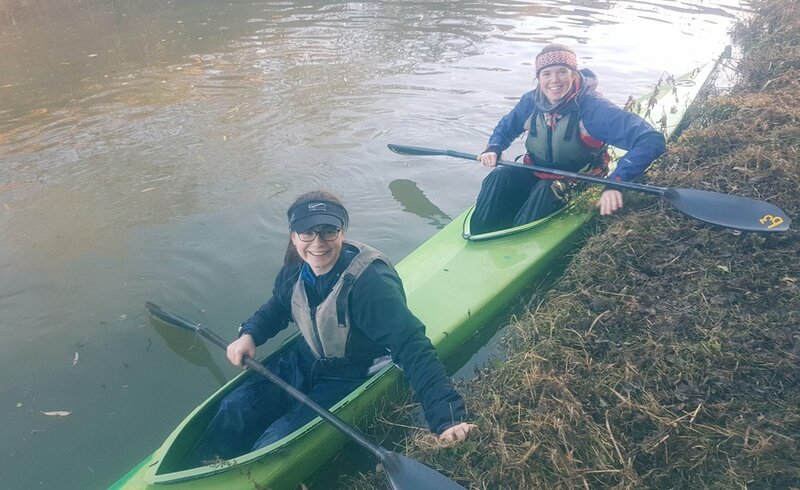 While we paddle our way across Europe this Spring and Summer, we will be collecting water samples and data for FreshWater Watch, contributing to their ongoing research into the health of freshwater ecosystems around the world. It was great to hear more about the work that they are doing, and how easy it is going to be for us – and anyone else – to take part in their project. In a few weeks we will be spending a day with everyone from FreshWater Watch getting fully trained up and taking part in their local water measurement campaign. Our training on the water has continued despite the freezing temperatures. 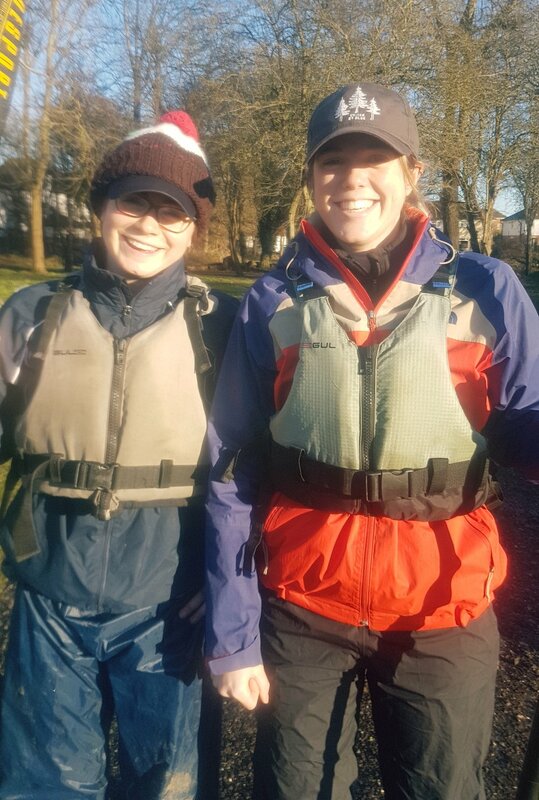 Just before Christmas, a quarter of an hour into a three-hour session, we had our first capsizing incident… Take it from us, the Thames is pretty flipping nippy in December! 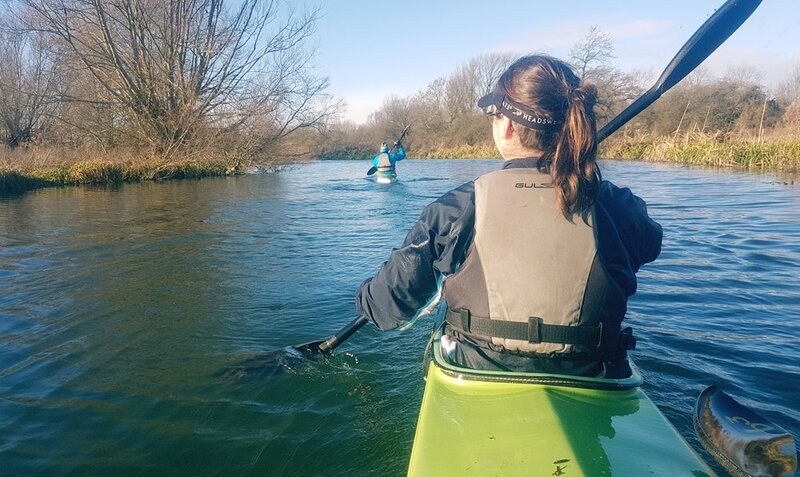 The water was so cold it forced the air out of lungs and we resurfaced spluttering and gasping, slightly taken-aback by the fact that we’d managed to tip our kayak over in possibly the calmest and most still stretch of the Thames in Oxford. Once we got our breath back however, we couldn’t help but start laughing – capsizing was bound to happen at some stage! A big thank you to Nick for literally heaving us out of the water and being patient with us as flopped around in fits of giggles. We would also like to take this opportunity to say a huge thank you to everyone who has already so generously donated to Pancreatic Cancer Action. Our primary reason for embarking on this slightly (very?) mad adventure is to raise money and awareness of pancreatic cancer: the 2-5% survival rate of this cancer has barely changed in nearly 50 years but through your support we can help fund research into early diagnosis, educate medical professionals, increase awareness, and support patients throughout the UK and Europe. If you would like to sponsor us, please click the button below!